People here walk the streets eating pie with their hands, but we go to an Ethiopian restaurant and they give us cutlery. Weird country! And yes we are in Canberra, not Wagga…for the second time this week. Again travel makes it hard to keep up with good blogging. Sorry. Also we should point out that the photo is just for illustrative purposes; Lisa did eat the food by hand. Cutlery is for pie, but wat and tibs must be eaten with fingers and injera. 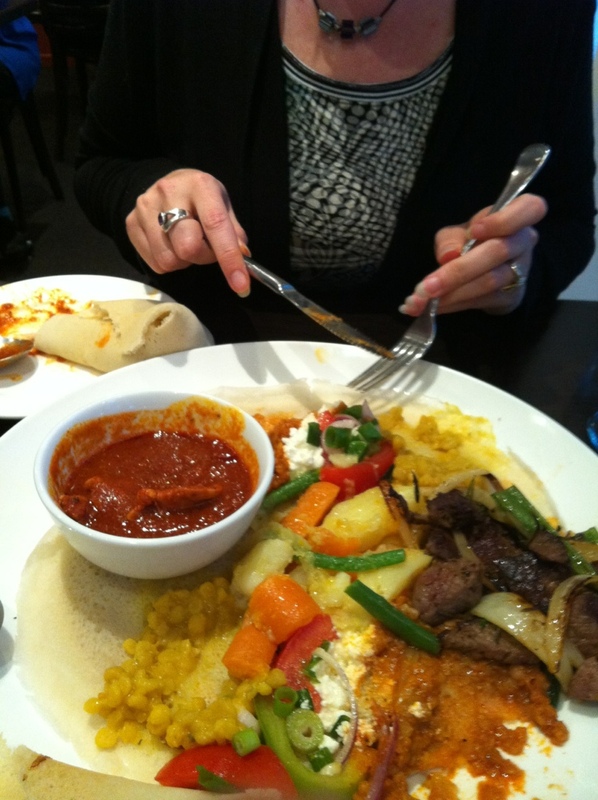 Image | This entry was posted in Canberra, cultural differences, food, pie, travel. Bookmark the permalink. I don’t think it was open before we left. Used to love Langano Skies. This place was actually pretty good but a bit…white is best description. Food needed a bit more spice. And the server was surprised when we said that most Ethiopian restaurants don’t even offer (have?) cutlery. Owner is Ethiopian but I guess he knows his civil servant market.